Everton vs. Chelsea : 11 February 2012. It was 1942. The storms of war had been blowing throughout Europe for three years. On The Wirral, the three Royal Air Force recruits had been thrown together; young men from disparate parts of the British Isles, conscripted to fight the threat of the Nazis, unsure of their futures. The physical training camp at West Kirby would be their home for three months; they were both excited and scared in equal measure. Hank, the large-framed butcher from Welling, was the leader. He strode into the red bricked train station and asked for three return tickets to Liverpool Lime Street. Jock, from a small town in the Scottish lowlands, his hair glistening with Brylcream, a slight figure, cigarette in hand, checked the tattered poster on the wall which detailed train times. Lastly, Reg, a placid and quiet shop assistant from Somerset, returned from the newspaper stall with a crisp copy of the local paper. There was not long to wait. After only five minutes, the three newly-acquainted friends were sat in the smoking carriage of the 10.25am local service to Lime Street. Hank, the gregarious joker, was rattling off a few one-liners and his two pals were soon rolling their eyes towards the cigarette-stained roof of the snug train compartment. The puns were awful, of course, but both Jock and Reg were happy that Hank was there, taking the lead, creating conversations and negating the burden of silence in that small confined space. The three youngsters, all aged nineteen, had only arrived on The Wirral the previous month. Within the first few weeks of training at the RAF camp, solid friendships were made and the ever-present worry of the uncertainty of what lay ahead was significantly eased. For Reg, this train trip was vastly different from the previous one just a month earlier. On that occasion, he had set off from his home town on the Somerset and Wiltshire border, his parents waving him goodbye from the platform, and had travelled alone to the north of England. At Crewe station, he had to change trains. In the middle of a cold January night, he had waited for four long hours, pacing up and down the otherwise empty platform. At no time in his life before it, nor at any time after it, would he feel more alone. But now, on his way to a new city with two friends – Hank’s jokes getting worse and worse – he felt a lot more relaxed and at ease. After four weeks of rigorous training, this represented his first day of leave and he was relishing the chance to spend time with his two new pals in the famous busy port city by the banks of the River Mersey. The plan had been to grab a bite to eat, flit around the shops and head down to the river and see the frantic activity of the ships around the dock area. Then, a couple of pints of bitter in a pub close to the station before catching the 8pm train back to camp. The two young girls sitting opposite were the ones rolling their eyes now. They had been sitting quietly, sharing a bag of sweets, trying not to stare too hard at the three young men in their immaculate RAF uniforms, each with accents far different than their own. Hank had made up the minds of both himself and the others before either Jock or Reg could answer. The afternoon’s entertainment had been decided. The train did not take too long to sweep under the River Mersey and the three young friends soon found themselves at the ridiculously busy and congested train terminal. Outside, the Saturday morning air was damp. On the walk tothea tram stop, the grim realities of conflict grabbed at Reg’s senses. The German Luftwaffe had deposited many tons of bombs on the city during the previous two years and great tracts of the immediate city centre had been laid waste. The scene which greeted him shocked him to the core; suddenly, the war had become all the more vivid. There were hundreds of buildings – shops, workhouses, factories, offices – now reduced to piles of rubble. He found it odd how chimney stacks had remained. He thought it bizarre that the interiors of upstairs bedrooms – with wallpaper on show – were still able to be seen. He pondered the hundreds of lives which had been torn apart so brutally. As the three of the young friends waited at the tram stop, they surveyed the desolation all around them. They were deeply shocked. They stood in silence. Not a word was spoken, but much was said. The crowded tram slowly wended its way through the city centre streets; past St. George’s Hall and the art gallery, past the shops full of Saturday bargain hunters, along Scotland Road and up the hill towards the football ground. The three friends were stood at the rear of the tram, hands in pockets, keeping warm. They were jostled from side to side with every slight change in direction. Busy local women nudged past them, their hands full of shopping, their hair in curlers, cigarettes lilting in the corners of mouths. Young boys, in tattered shorts and leather boots, ran alongside the tram, cheerily waving at the passengers. Dockers, with flat caps and white silk neckties, hopped on the bus at Kirkdale. With accents as thick as the fog which enveloped the grey city, these locals spoke quickly and it seemed that every word was spat, not spoken. The three young men looked on at the gnarled faces of these tough locals, with fading tattoos on their forearms, and soon realized that their home comforts seemed far away. Reg and Jock whispered to each other under their breath, not wishing to be heard. What they said to each other is not known. As the tram suddenly veered to the left, Hank – the taller of the three – soon spotted the dark silhouette of the main stand of Goodison Park in the distance. At the next stop, the three friends stepped off the tram, trying to avoid the murky puddles of rain by the side of the cobbled streets. Out of nowhere, hundreds of men bustled past. It was obvious that they were headed for the game, too. Hank, Jock and Reg – without realizing it – increased their walking speed in order to avoid getting pushed aside. At the end of the street, lined with painted and polished doorsteps – the handiwork of proud Liverpudlian housewives – the gargantuan stand on Goodison Road stood waiting for them. Hank had been to see Charlton play at the Valley on a few occasions, but the vast bowl of that stadium was different. The Valley was a sprawling mess of a football ground. Here, at Goodison, the stand stood right on the pavement. It seemed neater and much more impressive. Neither Jock nor Reg were football fans. Jock was not a sportsman, but studied the horses. Reg’s prowess was in the swimming pool. But all three stood still, in awe, at the enormity of the structure which greeted them. To the left, Jock spotted the frosted glass windows of a local hostelry. Without any words being exchanged, Jock quickly headed inside, his two friends left outside in his wake. They spotted Jock dart in the bar to the right of the main entrance of The Winslow Hotel and they quickly followed suit. The cavernous bar was incredibly noisy and the three pals struggled to hear themselves be heard above the din of orders being taken, jokes being shared, vulgar belly laughs, shouts and groans. A young lad strode through the bar, bedecked in Everton favours – the blue and white standing out against the dismal colours of wartime England – and attempted to sell match programmes. He was not faring well. The locals were more intent on drinking. An elderly gent, with glasses and a pencil thin moustache, spoke engagingly to Reg about Dixie Dean, the great Everton centre-forward, who once scored 60 goals in a 42 game season. He tried to score a goal. Talk of the imminent football match was minimal, though. It seemed that just being in an alien environment, so different from each of their home towns, was amusement enough. Hank looked at his watch and signaled to the others to finish their drinks. Outside, the rain had started to fall. The three friends quickly rushed across to the stand and did not notice that the narrow street, darkened under the shadow of the structure, was busy with an array of match day activity; grizzly old men selling programmes, young boys selling cheap paper rosettes, wise-cracking spivs selling roasted chestnuts and cigarettes and young girls selling newspapers. The three friends stood together, three amongst thousands packed into the terraced area at the front of the main stand. Thankfully, the rain soon subsided. The game began; the blue of Everton and the red of the visitors. But the match almost seemed a minor attraction. The three friends gazed in wonder at the modern stands on all sides of the ground. Each one had an area for spectators to stand. Above, in the upper tiers, were wooden seats, though these were not particularly well occupied. In between the two tiers was the dark green of the balcony wall; the metal cross struts at the front of the wooden panels gave the stands a unique appearance. Reg turned around and looked up behind him at the towering upper tier of the main stand. 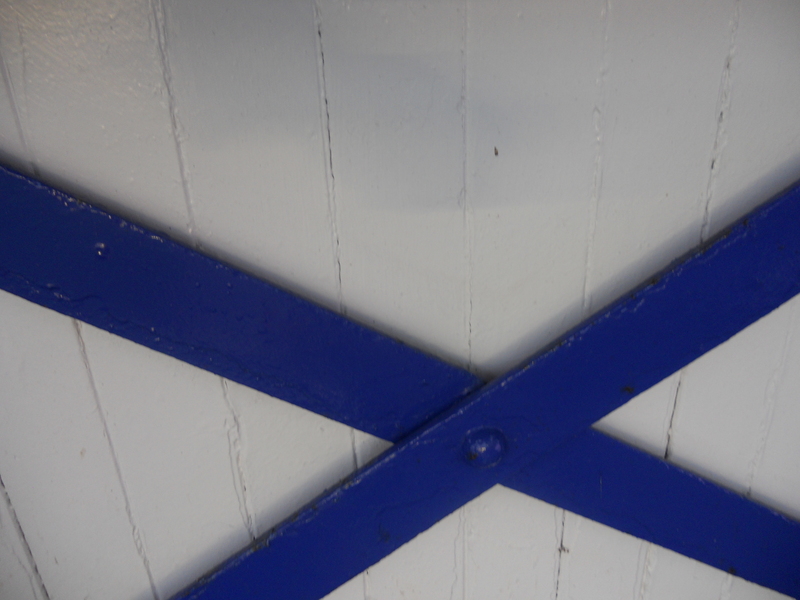 This metalwork was continued around on the main stand too. Above, right at the top, a gable was perched on the very apex of the roof and Reg could hardly believe how high it was. The football match was played out before them. The shouts of the players could often be heard above the quiet murmurings of the crowd. The boisterous behaviour in the pub before the game had been replaced with an almost muted reverence. In the corner, Jock spotted a church which abutted the lower terrace. As the temperatures fell and the noise from the spectators grew quieter still, the three young men became mesmerized by the movement and physical strength of the footballers. Everton scored early and played the more-flowing football. The diminutive wingers hugged the touchlines and sent over cross after cross into the muddied goal mouths. Further goals followed for the home side and the Everton fans were happy. Towards the end of the game, the sun had set and the darkening winter evening was making life difficult for spectators and players alike. At the final whistle, there was a ripple of gentle applause from the Evertonians. “Back to the pub for one more, boys?” asked Hank and the two pals concurred. Inside the warm saloon bar of the pub opposite, the locals looked cheered. There was a buzz of appreciation that the local team had won. The daily worries of their mundane lives, further threatened by the menace of conflict, had been put to one side for ninety minutes. Football had been an escape for them, just like it had been for Hank, Jock and Reg. It is 2012. The trip north from Somerset to Merseyside had started so perfectly as to be difficult for me to describe sufficiently. There had been an overnight frost and the trees and hedgerows were encased in hoarfrost. Snow remained on many of the fields. The skies overhead were of pure blue. I collected Parky at around 9am and we headed north on the Fosseway for a change. As we drove past Malmesbury, with its abbey high on the hill to my left, and then on to the old Roman town of Cirencester, I found it hard to believe how magnificent the Gloucestershire countryside looked. It was a real treat. A joy to be alive. All this and Chelsea too. What lucky people we are. As we descended the eastern edge of The Cotswolds at Birdlip and drove down into the Severn Vale, the snow soon disappeared. Our little winter wonderland had ended and we were now back on the M5; the road we seem to take every month on our travels up north to see the team play. It was an easy trip with little traffic. Maybe many had been scared off by the rumours of further snow. I strangely didn’t see any Chelsea colours on the 200 mile journey up the M5 and M6 to Meresyside, but I knew that we would be up at Goodison in force. On this occasion, I avoided the usual route into the city and I headed east on the M56. I had a specially-planned detour to attend to. Deep in the heart of The Wirral, I broke off the northbound motorway and drove along the oddly named Saughall Massie Road. My car quickly came to a stop and I pulled into a lay-by. There was a gate – closed – with what looked like a farm track beyond. But I knew better. From 1940 to 1957, that overgrown farm track once lead to RAF West Kirby; the very same camp that my father had attended during the very first month of his World War Two campaign. I had a moment to myself. I looked around. I noted the hedgerows, the slight undulations of the countryside, the church steeple and the woodlands. There is no doubt that my dear father, who I sadly lost in 1993, would have walked out of this very same track on that winter day, all those years ago, on his day trip to the city of Liverpool. My father had often spoken about his wartime visit to Goodison Park from his temporary home on The Wirral. It would be his only visit to a football stadium until he accompanied me to my first ever game at Stamford Bridge in 1974. To the left, there is a stone memorial, neatly attended. There is a large slab of local rock, with an airplane propeller attached. Parky took a few photographs of me alongside the memorial. It was a wonderful personal moment. Fantastic. We hopped back in the car and – I guess – retraced the route that my father took on that day around sixty years previously. I drove through Birkenhead, then through the Wallasey Tunnel. I was soon in the heart of Liverpool, crossing over Scotland Road and heading up the hill. At 1.45pm, we were parked up outside not Goodison, but Anfield. Many Chelsea fans head for The Arkles, no more than two hundred yards from Anfield, when we play both Liverpool and Everton. This familiar pub was packed full of Chelsea and I spotted a few faces. All eyes were on the “Hate Derby” of Manchester United and Liverpool. A pint of Becks Vier each and we were good. We met up with that man Jesus once again, this time with two other Americans, all three of them on the same internship programme in London. Elaine was from Pittsburgh and Megan was from Cleveland. We welcomed them to the Chelsea family. I first met Jesus outside this very pub before that awful game – Carlo’s last – in May. We hoped for no repeat. I was well aware that on the four and half mile journey, though, Parky and I had not mentioned the day’s game once. I also chatted with Paul, from Poole on the Dorset coast. He had an even longer drive than us; he had left Poole, the home of my father’s mother in fact, at 6.30am and had been in the pub since 11am. The pub was full of Chelsea, but there was a little band of young Liverpool fans; perched on small stools, faces gaunt, with old-fashioned haircuts, grey trackie bottoms – much loved by Scousers – and who were agonizingly watching the game on the TV. They howled with joy when Suarez made it 2-1. It was 2.30pm and we needed to move. Jesus and the girls were outside on the pavement, trying to drink lager from the plastic glasses with one hand and eat chips from a small polystyrene tray with the other. I’m not sure if the three Americans were taking advantage of their perceived view of our relaxed drinking laws, but they had taken the beer glasses with them and were supping at the lager as we walked away from the pub. Fair play to them – I could see they were enjoying themselves. Jesus had even taught them the words to “Celery” in the boozer. The girls were giggly but Jesus just wanted to get to Goodison Park. However, we stopped for a moment or so at the Hillsborough memorial outside Anfield and I quickly tried my best to explain what had happened on that horrific Saturday in April twenty-three years ago. We walked on. The winter air was chilling us all. At the bottom of Anfield Road, the main stand at Goodison was able to be seen just a few hundred yards away. The Archibald Leitch stand of the pre-war years – it was dubbed the Mauretania Stand as it was so huge – was partially demolished in around 1970 with the current stand taking its place on Goodison Road. We walked along Walton Lane; no time to waste now, the clock was ticking. I got to my seat in the front row of the upper tier of the Bullens Road stand just as the “Z Cars” theme was ending and the players were in the centre-circle, waving to the four corners of the classic Goodison stadium. We stood the entire game and were in good voice at the start. If the last game of the 2010-2011 season was bad enough…and it was, believe me…then this game was even worse. It was quite simply the laziest and inept performance by a Chelsea team that I can remember for some time. We were 1-0 down after just five minutes when a bouncing ball caused paralysis in our defence and the returning Steven Pienaar pounced to slam the ball past Cech. It was the same old sad story in the first-half; lots of Chelsea possession but no real threat. Two shots from Daniel Sturridge and Frank Lampard were the only real chances that I can remember. Our threat was so poor that Everton hardly had to put in a shift. I lost count of the number of times that ball was played back along the defenders. Our midfielders were not worthy of the name. Upfront Sturridge hid but Mata flitted around and tried his best. Torres was Torres. There were gaps in our three-thousand seats. The singing wasn’t great. It soon subsided. A few fans in the back rows of the upper tier began singing the turgid and tedious “Ten German Bombers.” What that particular song has to do with Chelsea, or how it can inspire our team, is lost on me. RAF or not, I don’t think my Dad would have approved, either. It was more of the same after the break. High balls into Torres; great. Whose idea was that? Our midfield were playing so deep and our only threat seemed to involving a succession of nicely-weighted balls from Juan Mata out to Ashley Cole. But then – a woeful cross and you know the rest. Luiz was, again, the only player who appeared to be playing with anything near the level of passion required. I am sad to say that the highlight of the match was an amazing shimmy from Pienaar over on the far side in front of the dug outs. OK – replacing a crowd favourite with a crowd pariah was never going to go down well, but this sort of behavior by our fans makes me sick. We should be above that. These ninety minutes where we have the opportunity to bond with our players should be full of positive noise only. We have the car trips home, the pubs, the offices and the internet chat rooms to dissect our team’s foibles and to berate them if necessary. But, for those ninety minutes, we should support The Boys In Blue From Division Two. Everton scored a second after a tackle on Ashley Cole left gaping gaps in our left flank which Everton nimbly exploited. Stracqualursi rifled past Cech and it was game over. Quite a few Chelsea departed. Sigh. At last Everton sang a different song. It was a good day for the blue half of Merseyside. “I’ve never felt more like singing the blues. When Everton win and Liverpool lose. Our few attacking thrusts were easily dealt with by Distin and Heitinga. Tim Howard was virtually untroubled the entire game; only a block from the substitute Lukaku sticks in my mind. This was a completely flat performance by manager, players and fans alike. I, as with others, was numb at the end. I met up with Parky outside the old stand. There were no positives to take from the game. The post mortem had begun. We walked back through Stanley Park, past The Arkles and up to a fish and chip shop. A shared portion of chips warmed us up as I headed out of the tight terraced streets around Anfield. I was back on the M6 at 6pm and it was a reasonably good drive home in the circumstances. We stopped off at the Air Balloon pub at wintry Birdlip at around 8.30pm and enjoyed a quick pint, a roaring wood burning stove warming us up nicely. It was minus eight outside. I eventually reached home at 10.30pm, almost fourteen hours since I had left in the morning. Parky and I always – without fail – enjoy ourselves on these trips, but the agonizingly poor performance of the team detracted from this day out on Merseyside. Andre Villas-Boas, lauded by everyone at the start of his Chelsea managerial career, is quickly finding out how fickle football fans can be. I have no fool proof answers to our current problems. I’m not an expert. I just hope and pray we can override this period of substandard play. Rumours of player power, new managers being touted, injuries to key personnel and under-performing players are the over-riding negatives that continue to eat away at us. I can’t guarantee that Villas-Boas is the answer. I just honestly feel that we would be foolish to dispense of his services when he has clearly been tasked with the onerous job of clearing away the old guard, bring in his own team and yet win trophies at the same time. Sounds like an impossible task to me. Birmingham City at home next Saturday. * Dedicated to the memory of Hank Brooks and Jock Inglis – my father’s two closest friends during the Second World War – who may or may not have been present at Goodison on that day in the ‘forties and my father Reg Axon, who certainly was. 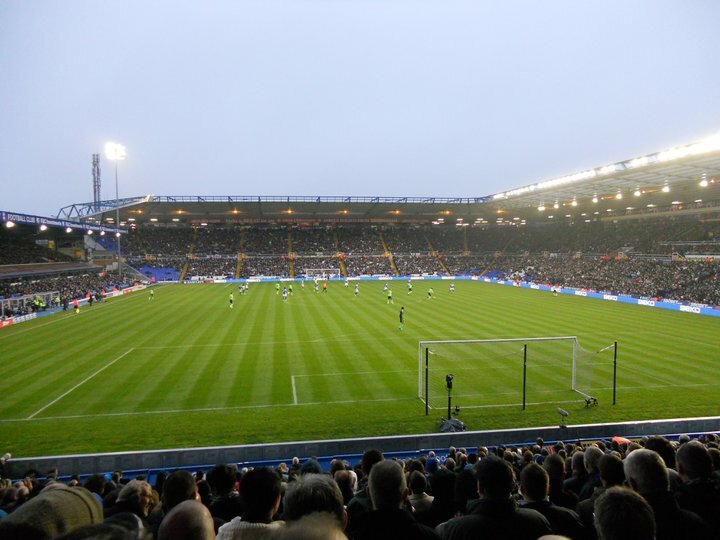 Birmingham City vs. Chelsea : 20 November 2010. As I drove through the old mill town of Bradford-On-Avon on the way to collect Parky and Kris, I received a text from Danny in California. He is coming over to England for our two games next week, but asked if I could send him updates from our game at St. Andrews. It made me realise how “My Chelsea Supporting Life” has changed over the past few years. Not only do I have my long-standing friendships with mates throughout the UK, built up over the years, but I now have an “extended family” of Chelsea friends who live in various states in America. It’s lovely, you know. Not a match day goes by without texts from San Francisco, Los Angeles, Fort Worth, San Antonio, New York and Philadelphia. I guess it’s all about sharing that common experience. I presume that it is human nature for friendships to either remain strong through the years or eventually weaken and I suppose it’s the same story for my match day mates too. However, I get the feeling that my ten or so closest mates will continue watching Chelsea for many seasons yet. I do wonder though – since I am currently encompassing my American mates in this topic – how many US based fans will dwindle by the wayside over the years. I only recently commented to Parky that quite a few CIA regulars seem to have fallen off the edge of this Blue Earth recently. Chelsea is for life, remember, not just for Christmas. We departed from Parky’s village at about 9.30am and we were on our way north once more. What a horrible, overcast morning. We encountered low lying grey clouds, drizzle and then rain…and then heavy rain as we drove past Bath and Bristol. It made the driving tiring…and I didn’t need that. Kris, like Parky, is into music and often DJs at weekends. This was to be his first away game and I could tell he was excited. I told the lads of a strange chat I had with my boss on the Friday. I’m not really sure what triggered the conversation, but my boss suddenly announced that one of his uncles once played for England. Despite being in the middle of a frantic few minutes, I had to put the demands of work to one side and ask him the player’s name. “Not Tommy Lawton?” I replied with a look of astonishment on my face. With this story aired, Kris spoke of a football-related tale of his own. In addition to being a drum and bass DJ, Kris is a carpet fitter during the week. On the Thursday, he was working in nearby Corsham and it transpired that he was in the house of the one-time assistant manager at Derby County Stan Anderson, who worked alongside the legendary Dave Mackay in Derby’s championship season of 1974-1975. This triggered some memories. I told the story of a Chelsea vs. Derby County game that I saw with my parents in the March of that season. It was only my third-ever Chelsea game and we had seats right behind the away bench in the new East stand. It rainy day and it was a poor game. We lost 2-1, but the thing that my parents and I always remembered was the abuse that a Chelsea fan in her ‘sixties gave Anderson throughout the game. He was constantly up on his feet, remonstrating with the referee, the linesman and this caught her attention. She started telling him to sit down in no uncertain terms. At one stage, I am sure she walked to the front and threatened him with her brolly. It was hilarious. For the next few years, whenever we saw Mackay and Anderson on the TV, we always laughed and pictured that woman waving her umbrella at them. Out of interest, before that game, I very well remember an American university marching band from Missouri performing on the pitch. I can still see the bright yellow of their colourful tunics to this day. After their display, they sat in the rickety old North Stand, perched on stilts in the NE corner. The band even started playing at various stages during the game – a bang of drums and a crash of cymbals here, a cacophony of trumpets and bugles there. It was quite a surreal sight…and sound. I wonder how many of those American kids from The Marching Mizzou remember their appearance at Stamford Bridge and I wonder if any are Chelsea fans today. As the rain worsened around Gloucester, we spoke of the games coming up in the tough month of December and the rumours about the fitness of Alex and JT, the stories about Ray Wilkins, the probable line-up at St. Andrews, and the inevitable raft of reminiscences from the past. Parky rolled out a few tried-and-tested tales, familiar to me, not so for Kris. On this day of quirky stories involving footballers from the past and present, Kris reminded me that one of his friends went out with former Chelsea winger Scott Sinclair. Like me, Scott was born in Bath, and of course now plays with Swansea. Another link – Scott now plays alongside Nathan Dyer, a local lad from Trowbridge. We stopped at Strensham and Lord Parky got the coffees in. I received texts to say that Burger was on his way and would be meeting up with Cathy, Dog and Mark in the city centre. By 11.30am, I had navigated the inner city ring round – past the Edgbaston county cricket ground – and was parked up at the Ibis Hotel, just a stone’s throw from the away end. We had made great time. We settled in for a lovely pre-match. As I said hello to the first of the fellow Chelsea fans in – Nick, Robbie and Mark – the hotel staff were clearing away the breakfast cereals and croissants in preparation of the onslaught of Chelsea fans. We settled down in a corner and awaited the arrival of the troops from near and far. Ajax from Wrexham soon came over to spend an entertaining twenty minutes with us. He used to run the North Wales coaches down to The Bridge, but his real claim to fame in Chelsea circles is that he often used to travel to and from games back in the ‘eighties with players Joey Jones and Mickey Thomas. There was quite a Wrexham connection at the time – Johnny Neal and Eddie Niedzwiecki too – and the club used to allow special privileges to these two Chelsea greats…they used to live in Wrexham, their childhood home, and only come down to Harlington to train once a week, then again for games at the weekend. Mickey was one of the fittest players we have ever had – he didn’t need to train – and Joey was just Joey. Imagine that happening these days. Ajax – it turns out – is a big Rangers fan too and has attended twelve Old Firm games in his life. It turns out that the both of us attended one particular Rangers vs. Motherwell game in the 1986-1987 season. It’s a small world at Chelsea. Especially for me. I’m five foot six. At about 1.15pm, the other members of The Bing arrived and joined the ever-growing throng. They had planned to have a few liveners in the centre, but their train had been delayed and so they got a cab direct to the hotel from New Street. After getting their beers, Alan, Gary, Daryl, Whitey, Simon and Milo came over to join us and we caught up with a few topics close to our heart…access to match tickets, travel plans for the next few games and the wash ability of Fred Perry, Lacoste and Henri Lloyd polo shirts. There were a few other familiar faces dotted around, too. The Nuneaton lot soon arrived too – Neil, Nigel, Jokka, Chopper and Jonesy – and it was good to see them. Our paths don’t often cross. It suddenly dawned on me that in that crowded hotel bar in Birmingham there were around 100 Chelsea fans, the die-hards, the loyalists…and most of us in our ‘forties. It’s our core demographic. I’m on 800 or so games, yet I suspect most were on 1,000 easy. Alan and Gary must be on 1,500 I would imagine. So, around 100,000 Chelsea games in that crowded bar. And as I looked around again, taking it all in, I hardly spotted any Chelsea gear, save for an odd scarf here or a pin badge there. I smiled to myself. I approved. However, there is no doubt that if I lived in Austin TX or Athens GA – or Bangkok or Botswana – I would occasionally wear Chelsea gear on game days just to show willing. Indeed, there are rare shots of me fully-garbed up in Chelsea blue at the Pittsburgh, DC, New Jersey, Chicago, LA and Baltimore games. But I haven’t worn a Chelsea replica shirt at a game in England since about 1995. If anything, I am more presupposed to wearing quirky Chelsea T-shirts. It’s just too easy to simply buy a replica shirt and try to feel part of Chelsea Football Club, but there really is – truly, madly, deeply – more to it than that. I’d rather spend £45 on a match ticket than the latest Adidas monstrosity. Besides, neither me nor any of my mates would be seen dead wearing the same shirt. Wink. We heard that Spurs came back from 2-0 down to get a highly unlikely win at Arsenal and we laughed. Not because Spurs had won – hell, no! – but because Arsenal had lost. I tried to picture Wenger’s squirming face. Millsy arrived at about 2.30pm and I commented about a photo he had recently posted on Facebook. It was a photo of him playing against a Charlton player at The Valley. It turns out he used to play for Tonbridge in Kent and once played against the then Charlton Athletic midfielder Lee Bowyer. Tommy Lawton, Stan Anderson, Scott Sinclair, Mickey Thomas, Joey Jones and now Lee Bowyer. It was certainly a day for stories. Where would it end? I was feeling left out. I once met former Bristol Rovers player Mike Brimble on a West Bay caravan park in Dorset in about 1971. Does that count? As we walked up to the ground, we heard the team and we approved…glad to hear Number 33 was playing and it was a big day for Malouda, who was dropping back into the midfield in an attempt to solidify the team alongside the unconvincing Ramires. Despite the overcast weather enveloping us all, I was confident we would do well. We had 4,400 tickets and surely we would be rocking. This was only my fifth visit to the humble and dowdy surroundings of Birmingham City’s down-at-heel home ground. I am yet to circumnavigate it – most unlike me. It’s the usual Ibis routine for me. So, after stopping to take a shot of Parky and Kris outside the away turnstiles, I walked through the unwelcoming approach to the away end. There were bare concrete walls and ugly steel roof supports to greet me. St. Andrews won’t win any awards. To start with, we were wearing the lime green kit. What was I saying about Adidas monstrosities? I’m struggling to think of a game amongst my other 800, where we have so dominated possession and yet have got nothing from it. Didier had three or four great chances in the first-half alone, yet the Birmingham City goal lived a charmed life. It goes to show how little attention I pay, at times, to some teams that I was under the impression that it was Scott Carson, not Ben Foster, in the Birmingham goal. I wish it was Carson, who was letting in three against Stoke a few miles to the west. Just like Joe Hart on Boxing Day last year, Foster was having a blinder. Then, on seventeen minutes, a rare break – we didn’t close down the cross, the ball was whipped in to Jerome who softened a header into the path of Millsy’s mate Lee Bowyer. He was completely unmarked. He easily scored and we had to endure this most unliked of players ( Leeds and West Ham on his curriculum vitae ) celebrating in front of us. Where was that woman’s umbrella from 1975? The rapidity of the break and goal reminded me of United’s first at Wembley in the Community Shield. Of course, the home fans chirped up for the first time in the whole game and it was to be the loudest they would be all day. Their club song really is the most horrible of dirges. It’s dire. At half-time, the immediate people around me occupied ourselves by listing our worse players ever…Dave Mitchell, Graham Wilkins, David Stride, John McNaught and Les Fridge all got votes, but I stood up for Keith Jones, while Gary defended John Coady. After Kalou’s non-show in the first-half, I wondered if he would get a vote. Someone said that the shot count was 14-1 in our favour in that first forty-five. There was deep frustration welling all around me. The shots reigned in, but block, block, block. An Ivanovic header – thump! – but it was dramatically clawed away by that man Foster. A Didier free-kick right at the ‘keeper, then a Kalou header flashed past the right post. Of course, we aren’t, but it helped my own coping mechanism. Back down at the Ibis, the troops had re-gathered and were enjoying a few post-game bevvies. I was expecting long faces and grumbles, but the mood was of stubborn resilience. We had tried our best. We had out-shot Birmingham something like 25-2. We would undoubtedly play worse and win this season. The ten of us had seen it all before…and the beers helped irradiate any maudlin feelings from the match. I supped on a strong coffee and Parky told of an altercation he had at half-time with a fellow Chelsea fan. Milo – 14 – took a couple of sips from one of Parky’s brandies. Whatever helps you through the night, eh? We stayed at the hotel until about 6.15pm. To be honest, we had a laugh and it made me realise what a very special bunch of mates I have. We had spent almost seven enjoyable hours in Birmingham; almost five hours in the Ibis and two hours at the game. That’s a good beer / footy ratio. The evening traffic was moving slowly…eventually I got back on to the southbound M5 and Parky was asleep. We heard that United had won – what a surprise. Kris bought me a “wake me up and slap me in the face” coffee at Strensham and I eventually dropped them off at 8.45pm. Parky was well messy and almost fell out of the car. As he stumbled, several beer cans fell out of his bag. Out of nowhere, Ben Foster leapt to Parky’s feet and caught them all.